I graduated with an honors diploma from Deloraine Collegiate Institute. Now I am working on a Bachelor of Arts 4 year with a double major in History and Anthropology in hopes of graduating in the next year or two. What accomplishments (awards, scholarships, volunteer work, organizations, memberships, etc.) are you proud of? There is a lot that I can be proud of. Being in university and a person with a disability for me is a huge accomplishment already, because in elementary school I was told by teachers I would not amount to anything. I would just either live at home forever, or I would not have a job that would sustain me. Today I am in university; I am on the Brandon University Student’s Union Council as the Accessibilities Director; and I am also the Accessibility Commissioner at the Canadian Federation of Students Manitoba. This all stems from the lack of opportunities I had to, and still do try to, overcome. I have never received a single scholarship/award for my academics. That is partially due to all the awards in my program of choice needing to be recommended by a professor and there is ABSOLUTELY NO DISABILITY SCHOLARSHIPS meant for students with accessibility needs. The only awards available are for people studying disability studies. The awards that I am proud of, though, are all the 4-H public speaking awards I have won for public speaking—all of them sit in a scrapbook today. I am sure there are over 50 of them in there. It was the first time I learned how to communicate to people and I found out I was really good at it. Before then I was very shy; I would avoid everyone, and no one really understood me so I was constantly repeating myself. It has gotten me from a small little classroom in Deloraine, to being at national conferences in my nation’s capital to speaking to MLA’s in legislature. Tell us about yourself/your background/your history? I did not really have a very positive upbringing. When I was diagnosed with Asperger’s Syndrome/Autism Spectrum Disorder-Level 1 in 2007, my parents split up shortly afterwards. I was raised in a single parent home where my mom was a student at BU not very long ago, and so the importance of an education for a woman was something my mother could not stress enough. At the time of diagnosis, I was basically told I had aged out of most therapies that were available for children. There was very little available for teenagers so I learned coping strategies on my own and navigated the world around me in my own way. I was the loner in school. I was bullied relentlessly because I was different. This bullying drove me into having severe depression and anxiety. It got so bad that at multiple points in my teens I was sent to a child psychiatric ward for attempts to take my life. I struggled without resources. My last thought of suicide was when I was 18. It would be another three years before I would be cleared by my mental health team to be stable enough to be off anti-depressants and my file closed down. Seeing that file close for the last time and no longer needing to take medication, it was the most freeing moment of my entire life. It felt like I could take on anything. That is when things skyrocketed for me. During my journey, I have had many odds stacked against me. Being a low income individual with a disability, who is also female is not an easy road to go down. University is something that, not long ago, seemed impossible. The first couple of years of university were rough. I remember at one point I physically rationed my food every day and lost weight due to food insecurity. Some days the free soup in IPC was all I ate that day. As time went on I got smarter, faster, and stronger. Today I very rarely worry about food. This emotional hell was something that made me who I am today. It has made me into the leader I am today, because those experiences made me realize I am stronger and that makes me pretty unpredictable. Unpredictable is an amazing thing to be because then you never really know what my next move is going to be. The opportunity could come out of nowhere and society is becoming a bit more accommodating each and every day, which is refreshing and healing for me. It is actually rather funny because that probably started marginally due to the fact I had a fascination with rocks as a child. Any rock I deemed pretty got thrown into my backpack and was then carried home to be added to the rest of the collection which drove my family crazy because my room had rocks everywhere! The one day I saw a book in the library basically explaining how the Egyptian pyramids were built out of these massive stones. I was questioning things like how did they stack the stones so high without cranes and what was the true purpose behind them? That is when the librarian told me about archaeology. I watched things like Relic Hunter, Indiana Jones and documentaries from just about anywhere just because it was interesting to me. Then in high-school I was told to do a project where if you could be anything in the world, what would it be and what would you do to get to that end goal? So my high school unintentionally reinforced and encouraged me into wanting to actually do archaeology when I found out that universities actually taught you how to do it! Do not ever let anyone tell you that you are less than anyone else; we are all comprised of ten fingers and toes, have voices, and have emotions and feelings. That is something that I really had to work on myself because we are always taught to put our needs and feelings aside for the group. Do not let anyone walk all over your dreams, aspirations and hopes for the future. It is important to never give up on your dreams once you are in the process of getting closer to them, no matter how hard or difficult it gets. In my first year of university, I almost quit on my dream because I thought it was too tough for me and that I was out of my league. That is not what life is about. Life is about determination, perseverance, courage, and at the same time love, laughter and great food. Do not be afraid to take a leap of faith. It is called a leap of faith because you do not know what is going to happen on the other side. Embrace the unknown because nothing is ever a guarantee. If you place all your bets on a guarantee, then you are not truly living. Instead you are existing in a safety net. We may be here one minute and gone the next so do not let an opportunity slip away because you are not sure whether you can go or not. I would like to be one of two things. I want to go digging looking for answers to the unwritten and written past. I also would like to one day become a professor. 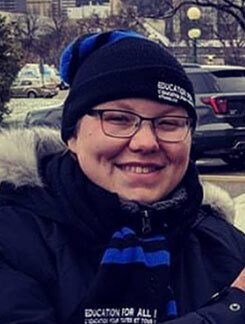 Since joining Brandon University in 2014, Whitney has contributed in a lot of ways to our campus community as well as province wide contributions advocating for students with accessibility needs as the Accessibilities Director at the Brandon University Students’ Union for almost two years and the Accessibility Commissioner at the Canadian Federation of Students (Manitoba) for the last year. Her duel role has taken her from sitting down and consulting on some of Brandon University’s policies with university administration and faculty to speaking in the Manitoba Legislature to politicians against bills that would directly impact students with disabilities from being able to have an equal access to an education. This behind the scenes work is equally as important as the public engagement that Whitney does as well. In 2016 she presented at the Mental Health on the Prairies conference hosted by Brandon University and the Brandon Regional Health Authority as one of the youngest speakers presenting. Whitney has also presented in my very classroom back in November 2017 to the psychiatric nursing students that will one day go out and help individuals that have accessibility needs, mental illnesses, and the community. She has broken down stigma on the campus in the #MyDefinition Campaign as becoming an ambassador and continues to be an ambassador to this very day (see attached poster). Whitney also does some of her own advocacy work in regards to Autism Spectrum Disorder, which she has been formally diagnosed with and this has allowed her the opportunity to speak on a community level, provincial level and even as far as a national level in Toronto, Ontario at the Reclaiming Our Bodies and Minds Conference, a conference entirely about disabilities. Her presentation was titled “The Autism Journey: Then vs. Now” which discussed how the process for diagnosis had changed over the course of 10 years, but also how this puts certain people with autism, herself included, at a disadvantage because of where they place on the spectrum (see attached poster). This past term alone she has spent countless hours speaking up for autism rights and disability rights. Some of the talks were to the Manitoba Library Association discussing customer service in libraries and what that would potentially look like. Her more recent most media worthy appearance was in the Brandon Sun as a keynote speaker for “Human Rights Day: Brandon without Barriers Lunch & Learn” discussing the Accessibility of Manitobans Act and what it means for our campus and our community. Another thing that Whitney does is she writes as a way to reach a widespread community that she is also a part of, the Autism Community. She has been published for the first time in the book called “The ABC’s of Life on the Spectrum” as a contributing author and she is continuing to write from her lense as a female with Asperger’s Syndrome/Autism Spectrum Disorder. This is a work that she has been praised for by the Autism community and she is in the works of being featured in another book this year. She also has been given the opportunity to be published in the Canadian Journal of Native Studies based right here at Brandon University which her peers and faculty recommended her for and she is set to be in the June 2018 issue. Whitney’s passion for accessibility on our campus and out in the community is just as strong for her scholarship. She is currently a full time student taking a Bachelor of Arts with a double major in Anthropology and History. When Whitney is not being an advocate she’s dedicating herself to her studies. Whitney serves as a source of inspiration for members of the campus community, particularly people with accessibility needs. Her genuine commitment to equality for those with accessibility needs and upholding community morale are part of the reason of why she is so successful. The work that she does with a disability, is something that needs to be recognized and commended. Whitney has not let the label slow her down from her personal goals and aspirations to change her campus and community towards a more accepting place to be. She has been known to put other’s needs before her own. Sometimes she is the first one on campus and the last person to leave at the end of the day. For these reasons and many more, Whitney represents the best and brightest of our students and stands as a role model for her peers and future students that will attend Brandon University. It is therefore my honor that I nominate Whitney to receive recognition as an Outstanding Female Student by the Status of Women Review Committee.